Visiting the leper hospital was an amazing opportunity. I couldn't help but think how hard these women have to work just to make it. This woman captured my heart because not only was she working but she had a baby on her back! 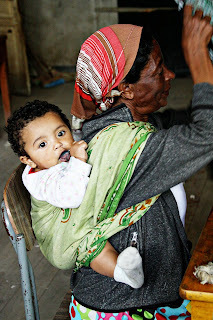 When we asked about the baby we learned this was not her child but her grandchild. What dedication. I could have spent an entire day in this sewing room with these ladies. Loved them.